Hotmail can also be accessed from a desktop email client. For that, you need the correct Hotmail settings. Hotmail is a web based email provided by the Microsoft company. It allows you to send and receive emails. Having a Hotmail account will also allow you to use Skype. You can also sign up for newsletters and such with your email account. Also, sign up for social media accounts using the Hotmail email account. Once, you set up Hotmail account, you can also save emails offline. That way you can review your messages offline as well. How to Setup Hotmail Settings on Email Client? Double click on the email client’s icon on the desktop. This will launch the email client. So click on Add Account. Your email client should support SMTP and IMAP. So first select that you wish to Manually configure server settings or additional server types. Then, choose IMAP or Internet Email settings. Now type in your Name and your full Hotmail email address. So type in the following Hotmail settings. These values for Email clients which supports SMTP & IMAP settings. For Incoming (IMAP) Server: imap-mail.outlook.com. 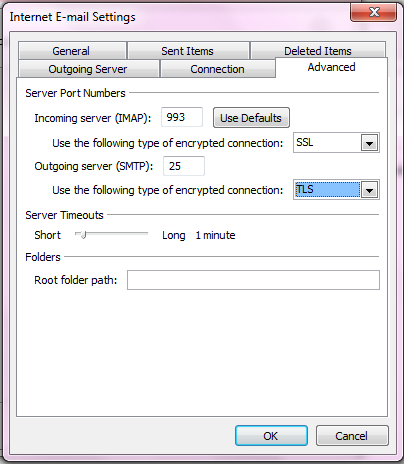 Put Port value: 993 and choose TSL for Encrypted Connection. For Outgoing (SMTP) Server: smtp-mail.outlook.com. Put Port value as 587 and choose TLS for Encrypted Connection. The above Port value can also be accessed when you click on More Settings. Your email client will then test the Hotmail IMAP & SMTP settings. If the values are correct then the set up Hotmail account on the email client is a success. You can find that sometimes your email clients do not support IMAP. For instance, it only supports POP settings. You can also configure Hotmail settings with POP3. We will show you the values you can use to configure. How to Configure Hotmail with POP3? For this, you need to first enable POP for your Hotmail account. Do so by going to hotmail.com. Then type in your Hotmail login details in the fields provided. Sign in and the Hotmail inbox should appear on your web browser. Click on the Gear icon on the top right corner of your browser. This should reveal a drop down menu below. Then, click on Options from the drop down menu. This should open your Hotmail settings in your browser. Look to the left of your screen. A tab should appear. So under Mail heading click on POP and IMAP. 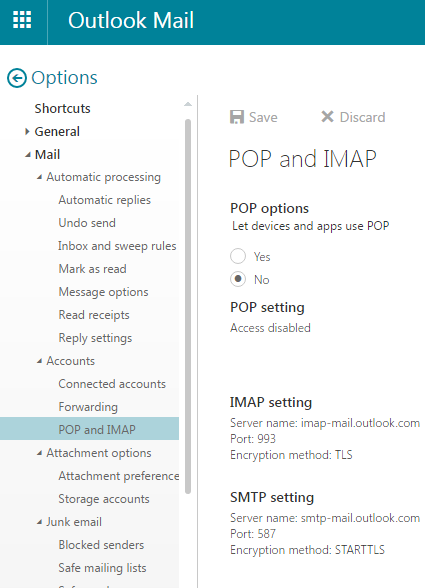 It will open up Hotmail Settings for POP, IMAP & SMTP. So under the POP options heading, select Yes. You can additionally choose to disable or able your devices or apps to delete Outlook messages. After that click on Save that is above. Then, on your email client, put these values mentioned below. Type in your Hotmail email address and password then. For Incoming (POP3) Server: pop-mail.outlook.com. Put Port value as 995 and choose TLS for Encryption method. For Outgoing (SMTP) Server: smtp-mail.outlook.com. Put Port value as 587 and choose TLS for Encryption method. Then, your email clients will test the accuracy of your input settings. It will then show an OK sign. So this is how you set up Hotmail account to your email client. You can always use the web browser to access your emails. However this way you can access it from your email applications even on your phone. For Hotmail login help on your browser, click on the link provided.